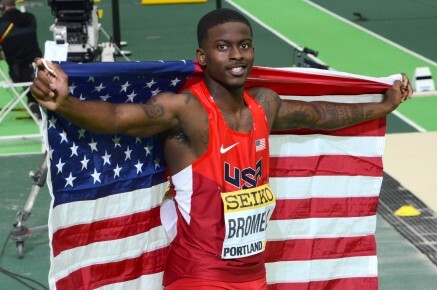 18th March 2016 – Trayvon Bromell (USA) delivered a personal best performance when it mattered most as he claimed the 60m title at the IAAF World Indoor Championships. Having won both his heat and semi-final earlier in the day (runs of 6.57 seconds and 6.53 seconds respectively) Trayvon took his place in the final. Displaying maturity beyond his tender 20 years of age, he showed no sign of nerves and got a brilliant start that saw him clear after 10m. Then using the speed that propelled him to the World Junior 100m record he stormed to victory in 6.47 seconds. This was the second senior medal Trayvon has won adding to the 100m bronze medal he won at last years outdoor World Championships.